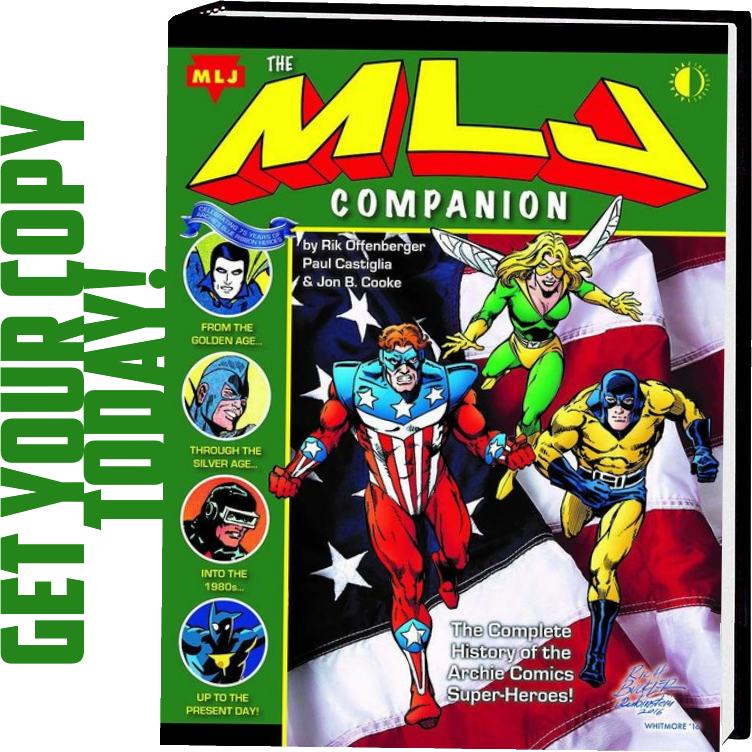 Chicago’s biggest pop culture convention of the year is right around the corner, and Valiant will be there with a spectacular slate of panels, signings, exclusives, apparel, merchandise, graphic novels, and even a HARBINGER WARS 2-themed beer! From Friday, April 6th through Sunday, April 8th, join Valiant inside Chicago’s McCormick Place at Booth #317 for a complete selection of trade paperbacks and deluxe hardcovers from the largest independent superhero universe in comics today, with critically acclaimed and award-winning titles including X-O MANOWAR, SECRET WEAPONS, BLOODSHOT SALVATION, BRITANNIA, DIVINITY, FAITH, QUANTUM AND WOODY, and many more! Also, be sure not to miss the SHADOWMAN (2018) #1 C2E2 Exclusive Variant, featuring a stunning limited-edition cover by high-octane artist Stephen Segovia (Action Comics)! In the epic tradition of X-O MANOWAR and BLOODSHOT REBORN, a staggering new beginning for Valiant’s supernatural icon starts here with PART ONE of “FEAR OF THE DARK” – a tense and gripping three-issue introduction pushing Jack Boniface to the farthest edge of fear itself…and into a startling, adrenaline-fueled fight for survival as Shadowman takes command of the birthright he was born to uphold! 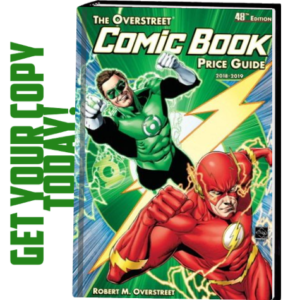 Plus: Get ready for the all-star talent charging into the Valiant booth for signings and free sketches, including Stephen Segovia (SHADOWMAN) and New York Times best-selling writer Matt Kindt (X-O MANOWAR, Mind MGMT)! Next: Valiant has partnered once again with Pipeworks Brewing Co. for the LIVEWIRE RASPBERRY IPA WITH LIME, a new limited-edition brew created to celebrate the upcoming HARBINGER WARS 2 – Valiant’s seismic six-part crossover event combining the talents of X-O MANOWAR creative team Matt Kindt and Tomás Giorello with SECRET WEAPONS creative team Eric Heisserer, Raúl Allén, and Patricia Martín! A portion of the proceeds from all sales of the LIVEWIRE RASPBERRY IPA WITH LIME will benefit Hope for the Day (HFTD.ORG), a Chicago-based proactive suicide prevention and mental health education non-profit. 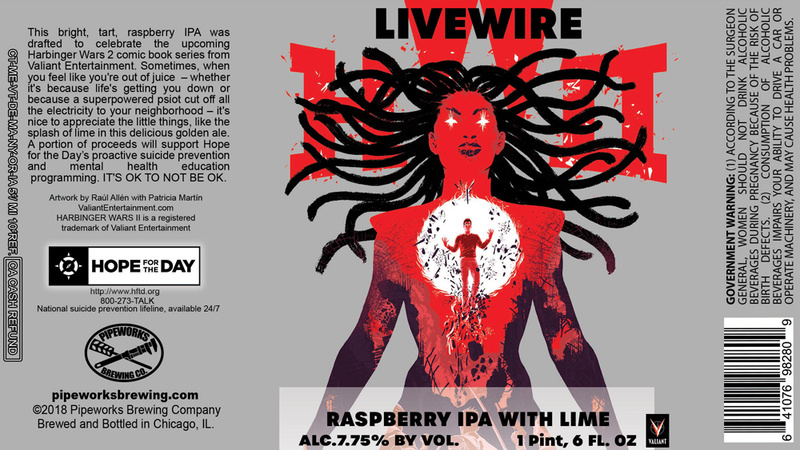 Pipeworks Brewing Co.’s LIVEWIRE RASPBERRY IPA WITH LIME is a limited release and will be available in select Illinois and New York bottle shops. Find participating retailers and distributors via Pipeworks’ location page, or visit them directly Thursday through Saturday at the Pipeworks Brewing Co. Bottle Shop (3912 W Mclean Ave., Chicago, IL 60647). Then, head to Room S405a on Friday, April 6th at 5:30 pm for the Valiant Presents: Harbinger Wars 2 and Beyond panel presentation! This summer, HARBINGER WARS 2 – Valiant’s biggest, most ambitious and most impactful comic book event of all time – is about to erupt in full force! 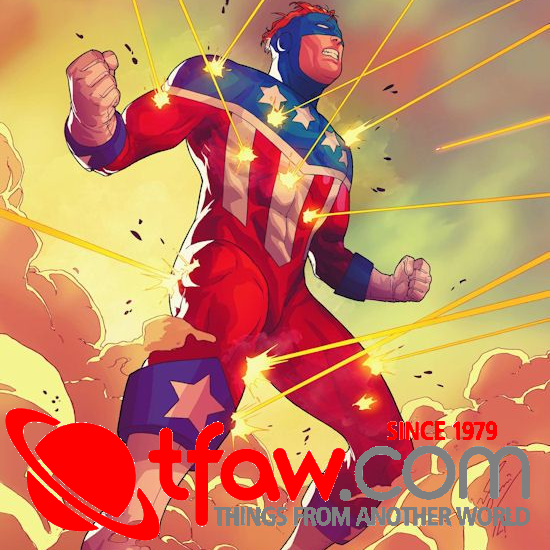 The Valiant Universe will never be the same as X-O Manowar, the Harbinger Renegades, Bloodshot, Secret Weapons, and a cast of thousands draw their battle lines in HARBINGER WARS 2! Valiant’s next major leap forward starts here with exclusive announcements and artwork, first at C2E2 2018! 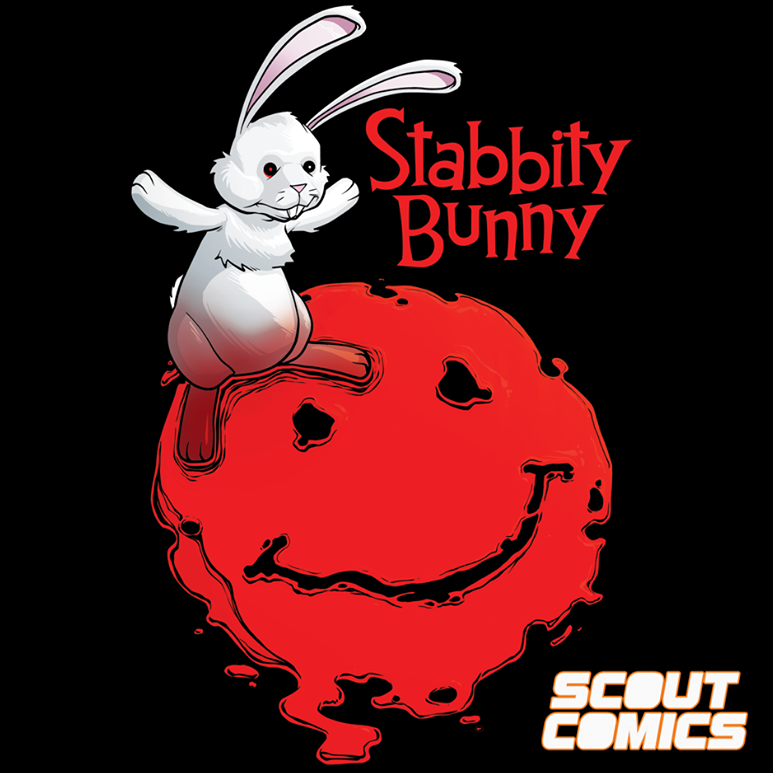 Plus: SHADOWMAN, BLOODSHOT SALVATION, NINJA-K, QUANTUM AND WOODY!, and much, much more! 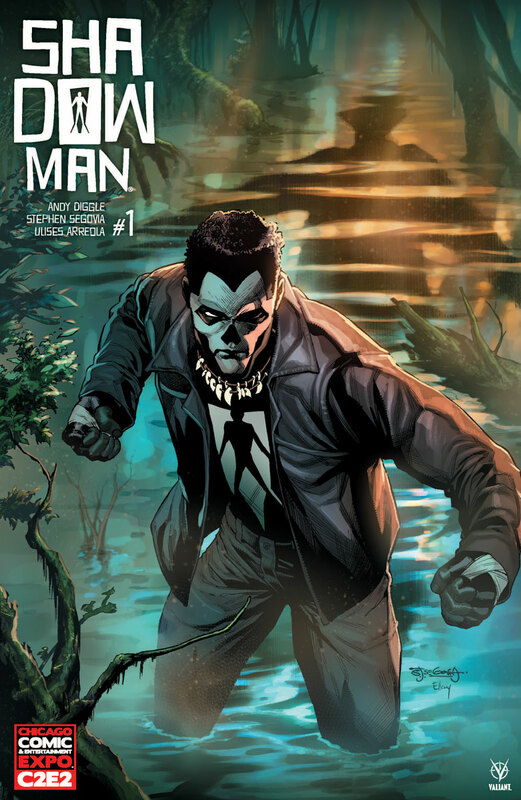 The excitement continues on Saturday, April 7th at 5:15 pm in Room S405b for Valiant Presents: Shadowman Spotlight! This March, Shadowman – more powerful, more terrifying, and more relentless than ever before – storms to the forefront of the Valiant Universe in an adrenaline-fueled ongoing series from superstar writer Andy Diggle and high-octane artist Stephen Segovia! Now, with a staggering new beginning for New Orleans’ supernatural guardian just around the corner, find out what the future holds for one of 2018’s most anticipated new series as Valiant assembles an all-star panel of staff and creators to reveal never-before-seen news and artwork, first at C2E2! Finally, join us on Sunday, April 8th at 12:15 pm in Room S405b for Valiant: The Craft of Comics! Join some of the talented creators and staff behind Valiant’s slate of critically acclaimed comic series for a candid, behind-the-scenes panel discussion! Find out just what it takes to put together a compelling story from start to finish, how to make your series stand apart, and how the editorial process functions at the highest levels – from the award-winning industry veterans behind the Valiant Universe’s greatest hits and a host of fan-favorite titles, including X-O MANOWAR, BLOODSHOT SALVATION, DIVINITY, and more! We’ll see you in the Windy City!